I am about to release a new member of the Alegreya clan: Alegreya Sans. The idea is to design a good companion for the serif version, able to work well on long texts and with a wide range of weights. So I am interested to know if you have some recommendations for improving it. I'm a big fan of Alegreya, so I'm excited to see the family grow. Yeah, the /J works well now. I don't see the same issue in "La fin du colonialisme" above, which looks quite organic. Love the tail on the /u, by the way! Cómo siempre ¡qué trabajo cuidado! Tengo una impresión similar a la de Christian en cuanto a lo orgánico (y caligráfico) de la fuente. La apuesta en Alegreya Serif fue alta y arriesgada en ese sentido y eso le da su gran personalidad. Personalmente extraño en la Sans ese carácter. La modulación notoria de los fustes sobre todo en la parte superior, algo de las proporciones y, sobre todo, el eje de modulación que es claramente inclinado en las serif (incluso con variaciones por glifos hasta donde recuerdo) que en la sans se torna muy vertical. This is, at least for me, a very difficult effect to achieve in a Sans Serif font in the sense that you have less things to play on each character. I have done some modifications on the font in order to give a stronger calligraphic feel to the family. I think this is working better on the strong weights, but in the thinnest version it is almost impossible because I don't have any modulation of the stroke. Love the family; a Sans is a welcome addition! I think that in each weight, the italic is superior to the roman -- in each case, it is much more calligraphic. The /z and /g are choice, and I'd really like to see modulation on /o, but that's my pet peeve. As for the roman, more modulation could help spice it up a bit; the lighter weights in particular are bland (but then, what can you do in such thin strokes? ), as said above. What is special about Alegreya is its character, and a sans kinda limits that. There is nothing limiting in the sans genre, except in the sense that there is no opportunity to apply a superficial veneer of “style”, i.e. stroke flaring and serif detailing. The sans is all about proportion (within and between glyphs) and the shape of curves. It is the pure play of letter form, with less limitation than being weighed down by the cloak of fine detail. You should start over, you are off on the wrong track making this a condensed style. At the very least, vary the widths and proportions of the characters more. They are too uniform at the moment. Try to oppose the “…vast and boring trove of low contrast, san serif or slab, huge lowercases, you can see them everywhere…” that David Berlow referred to in the Typedrawers Google thread recently, which he attributes to pandering to the demands of small type at low res. Those days are gone, with new higher resolution screens, and the ability of readers to increase type size. Try to make the play of letter shapes dynamic and interesting, and not rely on pseudo-calligraphic styling as the means of adding personality. Curious to know what weight of masters you drew? I notice the changing weights is not so linear or simple! Three masters, with exceptions in some characters, for example, the ampersand of the small Caps. 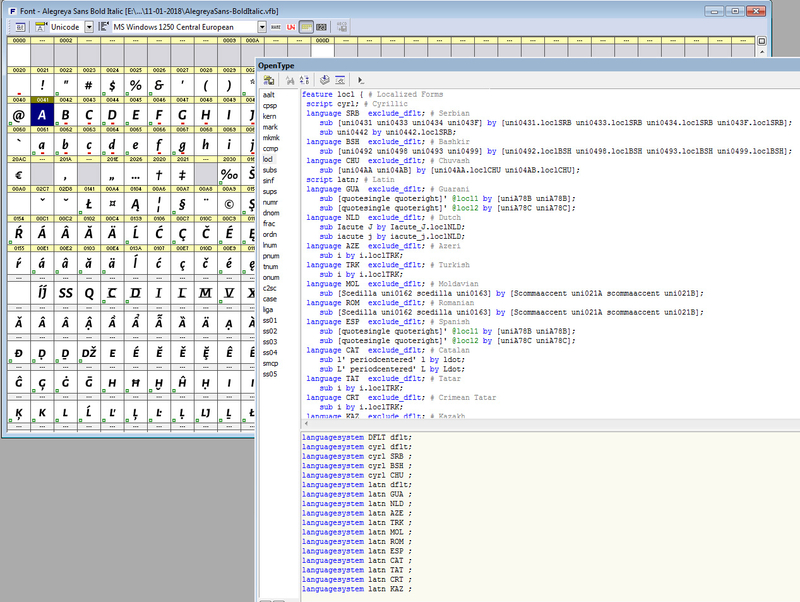 Maybe Alegreya has some hidden protection, and prevent me to to Compile locl fea for sub SRB Glyphs and Generate OTF. There is no problem with saving vfb file. * Sorry for Post repetition, JPG examples missing. Alegreya Sans and Alegreya Serif are really beatiful typefaces. But for Italic in feature locl for language SRB there is only sub for glyph б (uni0431.loclSRB) other four are missing. Is it possible to add in future versions of Alegreya sub feature for Serbian Italic glyphs: г,д,п,т ? 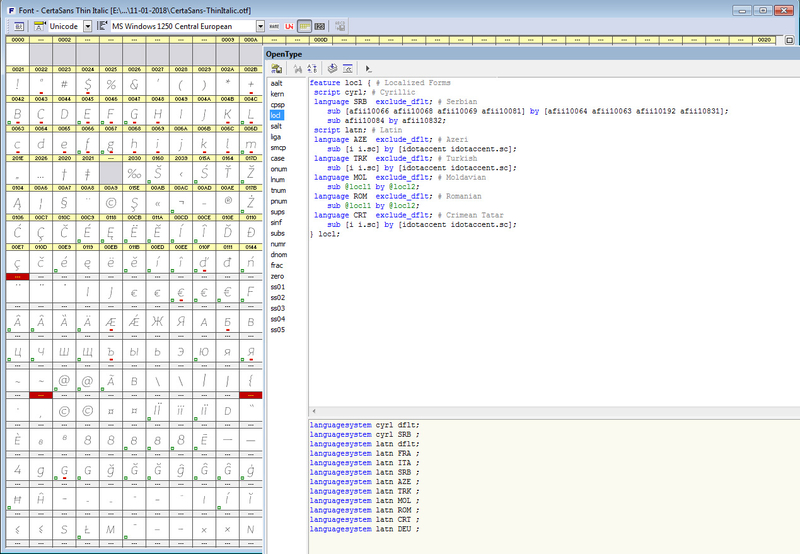 I personally tried to add it in locl fea, but it was partialy successful. I got in InDesign under the Serbian language this five SRB Italic letters, but some other glyphs change its places. Many thanks for fixing Serbian support (OT code bugs in italics) and fixing У.sc. Alegreya Sans and Alegreya Serif are really great work!